Having detected a recent spurt in local doughnut production, we decided a taste-test of the newest purveyors was in order. But first, the criteria: Freshness is paramount, obviously. Fresh from the fryer: ideal. You want airy and light for the yeast variety, a tender crumb with a touch of outer crispness in the cake style. Points off for excessive greasiness, leadenness, or over-the-top adornment. There’s a tendency among today’s doughnut maestros to let the imagination run amok, and we don’t like it. 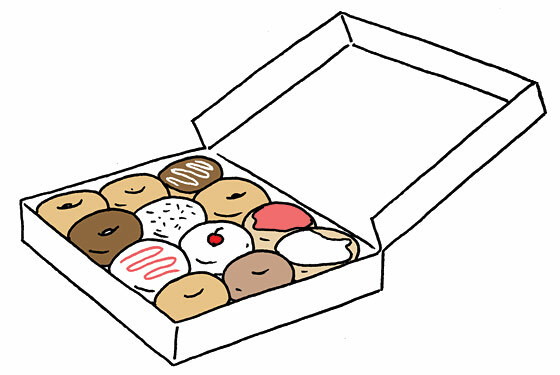 A doughnut, after all, should taste like a doughnut and not like a chocolate-chip cookie or a lemon-meringue pie—troubling simulacra of both cluttered our interborough path. 5. The fanciful yeast-raised concoctions at Dough (448A Lafayette Ave., at Franklin Ave., Clinton Hill; 347-533-7544) are replenished at a furious pace, but not furious enough to keep up with demand. Anticipation and sugary aroma pique the appetite, for sure, but if anything, Dough’s dough was too fresh—more wet and dense than light and airy. 4. At Wonder City Coffee & Donuts (277 E. 10th St., nr. Ave. A; 212-529-9702), the separately branded new breakfast program at the East Village’s Brindle Room, Jeremy Spector turns out distinctive sinkers made from a dough that contains mashed potatoes. They’re super-crisp and craggly crusted— a sturdy doughnut lover’s doughnut. Superb straight out of the fryer, they suffer a bit the longer they sit. 3. A sleek new branch of the Lower East Side artery-clogger Doughnut Plant opened recently in the Chelsea Hotel (220 W. 23rd St., nr. Seventh Ave.; 212-675-9100), and to mark the occasion, the shop unleashed three new flavors—salted peanut, chocolate chip, and oatmeal— all a bit busier, denser, and in-your-face than subtler classics like the orange cake-style doughnut. 2. Recently added to the weekend brunch menu at ABC Kitchen (35 E. 18th St., nr. Broadway; 212-475-5829), these glazed yeast doughnuts are tall and puffy, and melt in your mouth like cotton candy. 1. Our growing suspicion that restaurants might indeed be superior doughnut-delivery systems was confirmed at a wine bar, of all places. Here, on the brunch menu at Terroir Tribeca (24 Harrison St., nr. Greenwich St.; 212-625-9463), we found our ideal doughnut. It’s a larger version of the cider-glazed sinker popularized at sister restaurant Hearth, fried to order, tender and fragrant, transcendent in its humble doughnuttiness. And, just as important in discussions of this nature, the coffee is killer.